Tyler Bryant (second from left) and the ShakedownThere’s nothing like being on the ground level of something big that’s starting. Whether it’s investing in a stock of a young start-up company or the early stages of an underdog political candidate who goes on to win the office they’re seeking against incredible odds. That’s how I feel about a young guitar prodigy by the name of Tyler Bryant. Several months ago Desiree, a loyal Boomerocity reader from Pennsylvania, turned me to Tyler, encouraging me to check out some of the video of him on YouTube. What I saw held me spellbound and I was immediately hooked as a fan. I also felt like I was getting in at near the ground floor level of something phenomenal that was going to be big. Really big. Tyler is already commanding attention and creating an incredible amount of buzz wherever he goes and plays. The crazy thing is: There are people – very talented people – who have been at it a lot longer than he has and haven’t achieved ten percent of what he has. Since learning of Bryant, I’ve been researching his history and work and what an incredible story it is. He first picked up the guitar at 6 years old. A few years later, he reportedly sold a dirt bike that his parents had just given him so that he could buy an electric guitar. He was turned on to the blues at the age of 11 when he walked in to a Paris, Texas, music store and heard Roosevelt Twitty playing a Lightning Hopkins tune back in the corner of the store. From that point he was hooked on the blues. By the age of 15, Bryant had his own touring band, gaining notoriety in Texas, Arkansas, Louisiana and Oklahoma – even winning the Robert Johnson Blues Foundation’s New Generation award. The following year, he was tapped by Mr. Slow Hand himself, Eric Clapton, to play at the 2007 Crossroads Guitar Festival in Chicago. Having finished with high school early, he packed up and moved to Nashville at the age of 17. Once he hit music city, he formed a band consisting of fellow guitar player Graham Whitford (son of Aerosmith co-guitarist, Brad Whitford), Caleb Crosby on drums, and Calvin Webster on bass. Together, they form Tyler Bryant and the Shakedown and are enjoying a gradual, high-climbing trajectory that is sure to place them in ever larger venues and played on a growing population of fans. Tyler and I recently spoke by phone to, among other things, discuss his upcoming album, From The Sandcastle, that will be released on Tuesday (read the Boomerocity review here). Before we started chatting about Sandcastle, I asked Bryant if he misses Honey Grove, Texas. We quickly shifted gears to discuss Sandcastle. I asked him to give you guys a heads up as to what to expect from the album. “Oh, it’s just dirty rock and roll! There’s ups and downs on it but, for the most part, it’s simple rock and roll - very guitar driven. 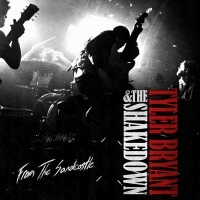 It’s the first band album we’ve done as Tyler Bryant and the Shakedown just because my band is such an instrumental part in creating our sound. They were very instrumental in making this record. So, yeah, I’m very excited about it! It’s pretty high energy for the most part. It sounds like a couple of kids got hold of a couple of microphones.” He says, chuckling. Comparing it to his last release, My Radio, Tylers says, “We’ve just grown since that project. I mean, that project was pretty much straight ahead rock and roll, too. This one has a few more songs than My Radio. We tried to bring out a lot of our roots and where we come from on this record. Listening and watching Bryant perform his craft it’s clear that his influences are many and varied in their genres. I asked him who his musical influences were and are. “Oh, there’s so many. Lightnin’ Hopkins was one of my first blues influences. I got turned on to him by a guy that was probably one of the most influential people in my life, Roosevelt Twitty, a Texas blues man who lives in Paris (Texas). I was really big into the acoustic blues guys like Robert Johnson, Son House and that kind of thing until I got into high school. Then I heard the Black Crowes and the Rolling Stones. I started listening to Tom Petty and the Heartbreakers and started to want to write songs. Not long after that, I moved to Nashville – when I was seventeen. I moved out and found a couple of guys who were in the same spot I was in and we put together a band. On impulse, I asked Tyler what he’s been listening to on his iPod recently. He just happened to have it on him . The fact that Tyler has, in less than three years, hit Nashville, formed a top shelf band, and getting the traction that he has is the stuff that many, many aspiring artists have dreamed about and never attained. Aside from such early career traction, there’s also the realization of his dreams to share the stage with some the legendary artists I mentioned a few paragraphs ago. Most recently, he was asked to tour with the iconic Jeff Beck with several performances having found their way onto YouTube. I encourage you to check them out. On the subject of Jeff Beck, I asked Tyler about his experience with the rock icon, who else he’s played with and who he would like to work with. “He (Beck) doesn’t talk all that much. He’s always been really supportive of me. He had me up there jamming with him every night. He’d kind of push me on stage, ‘Come on! Come on!’ – that kind of a thing. I typically ask the “more mature” artists what they haven’t done, project-wise, that they still hope to accomplish. Since Tyler is still clearing the launch pad of his career, relatively speaking, I chose, instead, to ask him what his dream project would be. His answer was immediate if not also short and sweet. As for his long term plans and goals for, say, the next one to five years, they’re crystal clear in his mind. I was curious what was Bryant’s guitar weapon of choice on stage and how many guitars he actually had in his arsenal. At this time, Tyler feels that he is fortunate to already own the guitar that he considers his “holy grail”. Even though, at the time of this writing, Tyler Bryant isn’t even quite 21 years old, I was curious if he had any idea as to how he wished to be remembered after he’s no longer on the sunny side of the earth’s crust. Surprisingly, though he indicated that it was a tough question, he quickly and succinctly had an answer. “Hmmm, that’s a tough one. I’ve definitely thought about it before because I had a producer say to me one time after playing a guitar solo, ‘Hey, if you died right now, would anybody remember that guitar solo?’ It was kind of an intense thing to say but it’s so true. If you want to be an artist that’s remembered, you have to be an artist that someone can remember. You can’t be forgettable and you have to do your own thing. “I speak for myself and the band when I say that we want to bring it to the kids because, when I was growing up, fortunately I had people in my life to play good rock music for me. But it seems like it’s a little harder to find these days. I want to keep blues alive. There’s this massive form of American music that’s been pushed under the bus a little bit by mainstream radio. It’s just the way things are now. It’s cool because there’s a lot of really interesting, great music out there now. But there’s some soul that’s missing in a lot of it and that’s what I want to bring back. 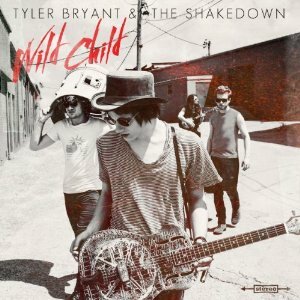 If you want to fill your mind with incredible memories of phenomenal, guitar-driven rock and roll, then you will definitely want to, a) purchase your own copies of Tyler Bryant and the Shakedown’s work – especially From The Sandcastle and, b) sign up for e-mail blasts from Tyler and the gang by visiting his website, www.tylerbryantmusic.com. You will be kept up to date on the band’s touring, recording plans and whatever else of importance might crop up.